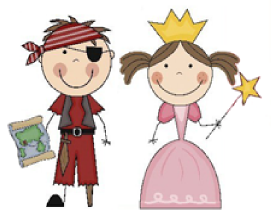 The Pirate and princess birthday party theme is great for siblings, twins or boy / girl parties. This is a great party theme when you need to include both girls and boys at the party. Creative ideas that will keep all the kids happy and having fun! Treasure Map - A fun way to make an invitation that will get guests excited about the pirate / princess party is to make a Pirate treasure map invitation. Print party information in the middle of a sheet of off white paper. Draw an island shape around the information and add a palm tree, mountains and broken lines that lead to a red X. You can say something like "X marks the spot!" at the top of the invitation. If you make the island look like your city or neighborhood and add a little street information it can double as a map to the party venue. Crumple up the paper and stain it by dipping it into a container of tea. Lay them flat and let them dry. Then roll up into scrolls and hand out to guests. See our princes themed party ideas. Pirate Side - Decorate with pirate flags, parrots, treasure chests, gold coins, treasure and brown streamers so the party looks like a festive pirate ship. Decorate the table in black and white and sprinkle gold coins around the party table. Decorate princess crowns and tie bandana doo rags on the pirates. Make princess wands and pirate swords from heavy cardboard covered with aluminum foil. Decorate pillow cases with pink fabric paint and write “Princess ________“ (name of girl) or "Pirate ________" (name of boy). Decorate fairy wands or scepters. or use a bubble machine and have the Princesses and Pirates pop the bubbles with their scepters and swords. Apply make up to the Princesses and draw on beards, mustaches, scars and sideburns to the pirates. Lay down a big flat board or piece of Styrofoam onto the ground. Blindfold the first player. The players have to walk the length of the plank and back (can’t turn around, must walk backwards!) without stepping off the “plank”. Princesses and Pirates throw plastic coins so they land inside a big treasure chest. Cut five island shapes from card board or poster board (or one more shape then the total number of kids in each team) - big enough for kids to stand on about 10 x 10. Tell the princesses and pirates that they are to use only the islands to sail across the sea (the playing field). Teams use the pieces by standing on them and then placing the extra piece at the line's front. The last piece is picked up and moved to the teams front - then they all move up one spot. The piñata can be filled with candies and small prizes and a clue that's next on the pirate's treasure map or treasure hunt. Let the kids take turns trying to open the piñata. * When the pirates first arrive at the birthday party you may want to have them decorate a paper lunch sack to hold the Piñata “loot” when the piñata is opened. This game will use princess scepters or fairy wands and foam swords. Divide pirates and princesses into teams. Give the teams 20 foil covered chocolate or plastic coins. Two treasure chests should be set up opposite the teams - one for each team. Kids take the sword (or wand) and balance 2 or 3 coins on the blade of the foam sword. They then run and put the coins inside their treasure chest. Then they go back where the next child has a turn. The one team that moves all their coins into the treasure chest is the winner. If they drop the coins while running to their treasure chest then they return to start and the next person has a turn. Once they master having two or three coins on their sword run relays that make them balance 4, 5 or 6. In two plastic pools filled with play sand (or in the summer fill with water and bubbles) and 50 or more pennies. On "go" teams send one person to try and find one penny. When a penny is found they run to their waiting team and put it inside the team's container. For each round have a short time limit, say 5 - 10 minutes, and play several rounds. Macaroni and cheese using the Shells pasta - serve in large conch shells. Fruit kabobs - skewer pieces of cut up strawberries, pineapples and bananas on pretzels. Peanut butter and jelly(fish) sandwiches cut into starfish shapes with a cookie cutter. Small wooden crates or treasure chests painted and filled with treasure. Black and Pink solid color Chinese take out containers.